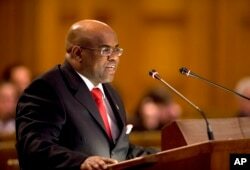 FILE - Mohamed Siad Doualeh, Djibouti’s ambassador to the United Nations, told VOA the time is right for the nations of the Horn of Africa to support one another. Doualeh is shown speaking in The Hague, the Netherlands, in 2008. 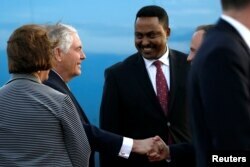 FILE - Former U.S. Secretary of State Rex Tillerson, second from left, and Ethiopia Foreign Minister Workneh Gebeyehu, second from right, meet in Ethiopia.